We are passionate about Continuous Improvement. We have worked with management strategy as Supply Chain Management, Quality Management, Continuous Improvement, and Lean concepts for more than 20 years. Furthermore, we have over 7 years of experience with the integration of World Class Manufacturing (WCM) and Total Productive Maintenance (TPM) in production companies. - Your company is in need of an external consultant to kick-start an internal improvement process – or review internal systems or processes. - You need to hire a new quality manager, controller, Lean expert, or Continuous Improvement coordinator, but the hiring process may take a while. - There is for some reason the immediate need to fill an interim position within Continuous Improvement, Lean management, or suchlike. - A need may exist to establish data extracts from or data interchange between existing internal databases/systems. Kaizen, team audits et al. 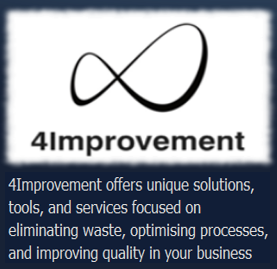 4Improvement is your one-stop-shop for all things related to Continuous Improvement. Are you in need of an external consultant for a one-time project/review/audit? Do you need to fill an interim position within e.g. Lean management? Do you have any other need in relation to our areas of competence? We offer a range of flexible solutions to meet your needs. Please do not hesitate to contact us, whether your requirement is for interim employment, interim management, consultancy, audits, reviews, or anything in-between. Our core business and our firm commitment is to help clients reduce costs, eradicate losses, shorten lead times, and increase overall efficiency. Please also see our mission statement below. 4Improvement supports clients in making the best of working with Continuous Improvement and becoming industry leaders by reducing losses and making significant improvements. 4Improvement provides clients of any size and in any industry with easy-to-use tools that enable their conscious and systematic focus on minimising losses, making significant improvements, and thereby becoming industry leaders. We aim to be our clients' preferred vendor of Continuous Improvement software tools, statistics, analytics, and associated consultancy services. We are going to achieve this goal by acting with care, dedication, and sincerity towards our clients, and by being accountable for delivering on our commitments. Whether your organisation is a manufacturing company, a service provider, or any other type of business, it will be able to benefit vastly from implementing 4Improvement tools. We are proud to be serving a number of global industry leaders of various trades already, and we are confident that any business can find new ways of harvesting improvement potential by the use of our solutions. 4Improvement offers dedicated software solutions that support Continuous Improvement based on the Japan Institute of Plant Maintenance (JIPM) principles. Our dedicated software solutions comprise a suite of Continuous Improvement tools based on MS-Excel technology. The methodology implemented by our tools is that of the Japan Institute of Plant Maintenance (JIPM). MS-Excel may be widely conceived as a personal rather than an enterprise-grade platform. We respectfully beg to differ. Our solutions have been in development for several years. Each of our tools is today a robust stand-alone application, which is able to cater for the needs of several hundred concurrent users without notable performance degradation. Furthermore, all of our tools are modularly integrated to utilise the same database. This allows any client to implement any subset of our solutions in whatever sequence suitable to the individual business. Please see our solutions page for detailed descriptions of our different solutions. 4Improvement solutions are richly enhanced by graphs for visualisation and analysis. This makes data easy for every stakeholder to understand and is useful in daily management. Every tool we offer comes with comprehensive visualisations (graphs, diagrams, etc.) for easy monitoring, data and trend analyses, and following-up on target achievement. The metrics presented by the various visualisations have been designed to cater to the needs of all stakeholders, from shop floor to board room. This allows departments, managers, and process owners across the organisation to focus on their individual KPIs, which provides for a systematic and consistent approach to Continuous Improvement. A significant side benefit of using the same dataset throughout the business is the elimination of any discussion about data validity - since everybody basically has access to the same database. That in itself represents a substantial Loss management leap, cf. our Loss Management Tool. 4Improvement offers tailored guidance, counselling, and bespoke solutions to clients that are already implementing Continuous Improvement methodologies and tools. Our experience within the fields of Lean, WCM, TPM, TQM or TPS, Kaizen, 5S, and related principles spans more than a decade. We are passionate about Continuous Improvement, and we would only be happy to hear from you, if you are considering renting our expertise for any period of time. We typically assist clients in extracting data from their current IT systems in order to establish a baseline dataset as a starting point for the implementation of our solutions. In most cases it is desirable to have a permanent database connection for continuously feeding validated production data into our solutions. Whatever your needs are, and regardless of your current status within e.g. Lean, WCM, TPM, TQM or TPS, Kaizen or 5S you are welcome to contact us. We are confident that we can help you make significant changes for improvement, whether through specific advice on implementation or coaching/sparring. Our ability to address the particular needs of individual clients allows us to accept a wide range of challenges and offer dedicated solutions to suit such specific requirements. Please do not hesitate to contact us, if you have a specific enquiry.